I read these scriptures today. Who ever said Chronicles was boring? I don’t think the glory of the Lord filling the house of God is boring!!! There’s nuggets in there…just get in tune with the author. Truly God was fullfilling what the psalmist spoke of in Psalms 22 “but thou art holy, O thou that inhabitest the praises of Israel.” I believe God comes near when your heart is truly praising God. Another event also seemed to bring the presence of the Lord near, prayer. II CHRONICLES 7:1 ¶ Now when Solomon had made an end of praying, the fire came down from heaven, and consumed the burnt offering and the sacrifices; and the glory of the LORD filled the house. I read this scripture today. I love how Solomon phrases this statement. What an insight. The depth of our Lord Jesus. How measureless and strong!! Take time to praise Him today for His goodness and His greatness. I thought I’d post a picture to spruce up this otherwise text-only site. 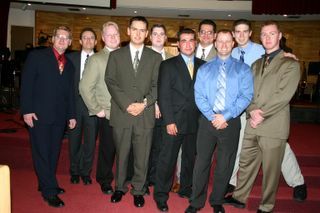 Here Nathan and I are in Tucson with a group of other ministers that were at the meetings in March 2005. Thou art my portion, O LORD. What do you need to be happy? A nice house, a nice car. What? You’d be happy in a nice quiet apartment and a clunky car that just got you from point A to point B? Honorable!! You don’t need much, just a few nice things and your tummy fed. That’s you…content and happy. David gives us some insight on what happiness and contentment is. Sure thing! We all say “Jesus is my portion. He’s all I need” When it comes right down to it however, do we really have that revelation in our hearts? Truly all I need is just Jesus! When hardships come…are you worrying? Why are you worrying? I thought all you needed was Jesus? David gives us some more insight in another passage about a good man: “He shall not be afraid of evil tidings: his heart is fixed, trusting in the LORD” (Ps 112:7) Not afraid or worrying over bad things, or not having enough things…”things” just aren’t even in the picture. Your “heart is fixed, trusting in the Lord.” Jesus is your portion. Lay down worries, wants, doubts, failures, guilts, and any thought to “things.” Pick up your portion – Jesus.